If crafting a successful sequel is akin to leaping tall buildings in a single bound for a filmmaker, delivering a top-notch third entry is like climbing Mt. Everest. With 2005’s Batman Begins and 2008’s The Dark Knight director Christopher Nolan has spent the better part of the last decade in the mind of Bruce Wayne/Batman and the place he loves and calls home, Gotham City. In the first film, the city was under attack. In the second, the danger was directed to our titular character. The end of Nolan’s Dark Knight Trilogy sees the man and the city once again facing destruction…and this time there may be no happy ending. Have no fear that I’ll spoil things for you as you continue this review. To divulge more than is necessary would be to rob the reader of experiencing the film in the theaters along with denying the viewer the opportunity to make their own discoveries. I realized about halfway through the nearly three hour running length that the previews thus far had only shown part of what is really going on in the film so even if you’re like me and have seen the trailer(s) countless times in the last year just know there is more in store for you. In this third outing, all of the collective elements come together in service to the greater good (and bad) of Gotham City and the Caped Crusader. Nolan has pulled out all the stops and has asked his assembled team to do the same. 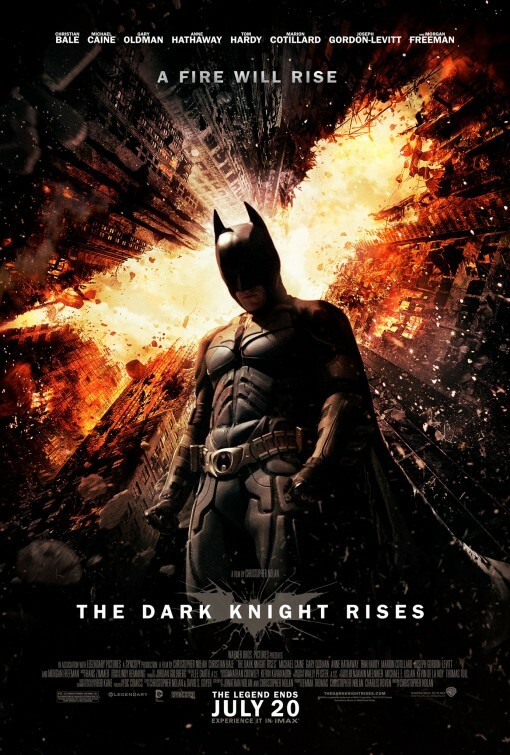 Opening with a spectacular stunt sequence (that I reviewed when it was shown in IMAX theaters in January), The Dark Knight Rises doesn’t so much hit the ground running as it does start off with a few warm-up laps. That pacing is OK because the running length and story arc provided by Nolan clearly has an endgame that can’t be guessed at immediately. Like the previous two films, this could easily have been a standalone Batman movie that doesn’t necessarily require previous knowledge to appreciate and enjoy. Eight years after the events of The Dark Knight we find Bruce Wayne (Bale) living as a recluse similar to Howard Hughes in his later years. He’s given up the cowl due to the proceedings at the conclusion of the previous film and retreated back into his lonely existence. His is a solitary life, solitary even from Alfred (Caine) who we get the impression sees him less and less. When circumstances necessitate ‘The Batman’ don his suit again, it may be at the cost of more than just a few broken bones and spirits. New characters for The Dark Knight Rises include Hathaway as Selina Kyle…a slinky cat burglar that is never called Catwoman outright but certainly looks the part. With a clever mask and sleek costume she’s overall no match for Michelle Pfeiffer’s seminal take on the character in Batman Returns. Still, Hathaway has checked her wide eyed, golly-gee, toothy, standard performance at the door and gotten in step quickly with the tone of Nolan’s material. I wasn’t convinced of her casting when it was originally announced but she’s acquitted herself nicely here with a well played performance. Another character introduced is Miranda Tate given life by Cotillard in yet another spot-on bit of casting. Cotillard plays her cards pretty close to her chest as an entrepreneur that has a vested interest in the Wayne Corporation. Her participation for most of the movie is small but quite effective when she’s called upon later in the film. While absolutely no match for Heath Ledger’s Joker, Hardy makes bad guy Bane appropriately rough and frightening. Ledger was so perfect because his character was an enigma that kept you off balance. Bane is the opposite…you know when he shows up that asses will be kicked in no uncertain terms. Here is a foe that you actually can believe could wipe out Batman with his bare fists. The problem I have (and have had since my original review of the prologue) is that the mouth device Bane wears coupled with Hardy’s thick-ish Brit accent makes much of Bane’s dialogue totally unintelligible. I caught more than I thought I would but I do have the feeling a few more viewings will be required to really get a handle on the material. Oldman continues to be the center of the film with his valuable presence but it gets shared this time with Gordon-Levitt as an idealistic Gotham City cop that has more in common with our main character than it may appear. Gordon-Levitt is an actor that gets better with each role he takes on. Gone is the long-haired kid from a hit television show and present is an actor that Nolan is obviously quite inspired by. The evolution of his character in this one film only works because Gordon-Levitt and Nolan worked in tandem so well to give him blood and breath. Freeman is less of a presence in this film but then again he has always been a sideline character that is called upon when needed. It’s not totally Freeman’s fault…it’s probably the casting of someone with his gravitas in an admittedly serviceably written role that makes you feel something is missing. Caine too has some great moments in this but his disappearance for much of the action in the last half of the film is one of a few quibbles I had with the film. Speaking of quibbles, Caine’s absence and another moment involving him are just two of I’d say five problems I had with the movie that I won’t discuss here. They involve major plot points that I can’t give away but after you’ve seen it let’s talk and I’ll let you know a few creative choices I would have changed/removed that I felt kept the film from being the best of the trilogy (that still belongs to The Dark Knight). Nolan’s knack for staging incredible and shiver inducing action sequences is still displayed in full force here. Having much of this play out over Hans Zimmer’s drum heavy score or without score at all were brilliant choices and only add to the gratitude I had for what Nolan has done for Batman over three strong pictures. How it all ends is for you to discover but I will say that I can’t imagine someone leaving the theater not feeling satisfied/complete in some way. It may not be the ending you wanted, needed, predicted, or dreamed of (and I’m not saying it’s not!) but I get the overall sense that this was always where things were headed and Nolan kept his eyeline on the horizon to get to this finale without making sacrifices or concessions to his vision. It’s one of, if not the, best trilogies in film history right up there with The Lord of the Rings and Star Wars . On its own, The Dark Knight Rises is a film brimming with soul and strength…like Batman…like Bruce Wayne…like Gotham City itself. The legend may end…but it won’t be forgotten. Very well written indeed… you have really succeeded in eloquently expressing your thoughts on the movie but I believe that you have been too generous in your overall analysis. Amazing opening imax sequence which looked fantastic even on my 32 inches HDTV.Possibly the best Christopher Nolan movie and way better than inception.